Anthony O’Leary leads from Baltimore Sailing Club‘s Neil Hogan after the first six races of the 1720 European Championships on Dublin Bay. 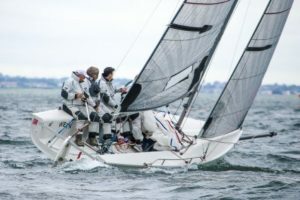 Hogan, the defending champion, scored a 3,5, 1, 3, 4 and 1 so far in gusty northerlies but O’Leary leads after scoring 6, 1, 2, 2, 2 and 2 in the 17–boat fleet. Third overall is another Baltimore SC boat, Smile and wave skippered by Ben Cooke on 25 points. Tom Durcans T-Bone is currently lying 6th, Atara skippered by Aoife English in 12th and Gary Rhodes Heroes and Villains in 15th. View full results here. Racing continues tomorrow. 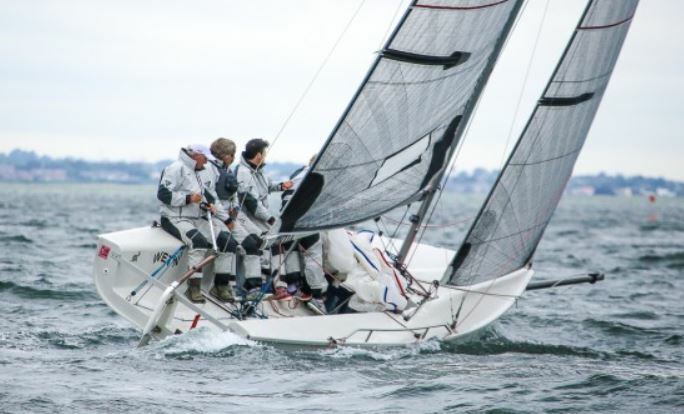 Keelboat race to Aghada is cancelled.